Well known for his many victories & cleverness! 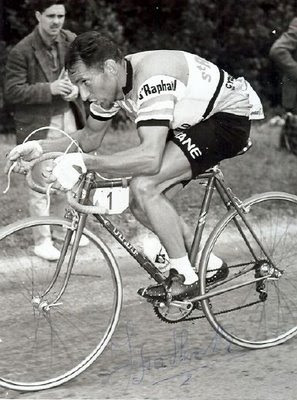 One of the most enduring nickname(s) in cycling is Frenchman, Jean Stablinski. He had a few. Edward Stablewski was a son of Polish immigrants in the coal mines of Northern France. His was an obvious reason to escape the back breaking poverty of the mines to become a racing cyclist. When he turned 16, he became naturalized French and rode his first race. At the age of 21, he signed his first professional contract. Most significantly, he changed his Polish name to a more French name, Jean Stablinski. His wins were quite amazing. 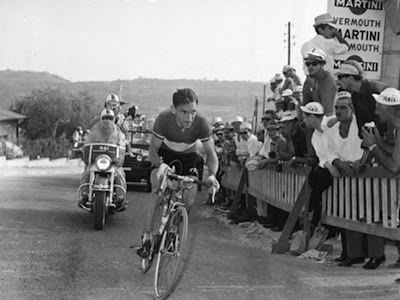 Five stage wins in the Tour, 1958 Vuelta overall victory, the first Amstel Gold Race in 1966, 1962 World Road Champion, Trofeo Baracchi(with Anquetil). And countless top ten placings. He won an incredible four National Road Championships came second twice and nicknamed, "Monsieur France." During his career which spanned from 1958-1967, he was part of the same teams as his friend Jacques Anquetil, he excelled as a crafty road tactician. Often working in the service to Maitre Jacques as a support rider. He was also known as, "Stab." But, my favorite two nicknames are, "the witch doctor" and "the fox," for his talented knowledge of the race! winning the 1962 World Road Race, Salo Italy.